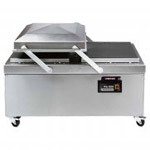 Northern Data Ltd have a long provided vacuum packing and meat mincing equipment to both retail and industrial companies. 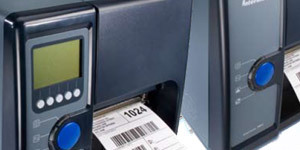 We have vast experience and knowledge which enables us to supply the best machines for your individual requirements. Ideally suited to butchers, restaurants and small food processors, the table-top vacuum packer comes with a choice of Busch vacuum pump. The 16m3 vacuum pump is the perfect choice for restaurants and smaller butchers shops for infrequent use, and the 21m3 vacuum pump is for more frequent use. 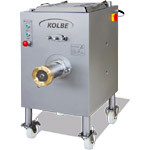 The 440-ST vacuum packing machine comes complete with a seal beam capable of sealing a bag of 440mm in width and the distance from the seal beam to the back of the chamber is 370mm. 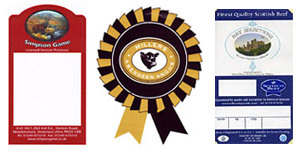 It creates a double seal on the bag and can be easily converted to seal and cut off just by changing the wire type. 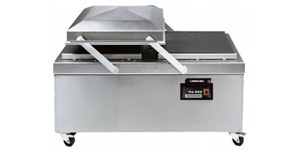 The Turbovac SB-520 vacuum packer is part of the Aluminium vacuum packing range. 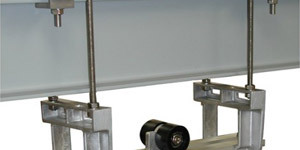 The vacuum packer is floor standing and is constructed from stainless steel with a coated aluminium chamber. 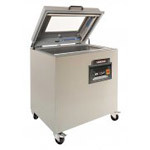 The SB-520 vacuum packing machine comes with a digital display which can loaded with up to 9 different programs to suit different product types and different bag thicknesses. 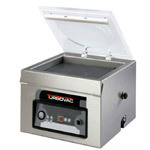 The SB-520 vacuum packer has various options available, starting with the electric supply. The vacuum packer comes as standard with a Busch 63m3 vacuum pump running a 3 phase supply, however this can be changed to the equivalent 1 phase pump. The Turbovac 1000STE XL vacuum packing machine is the largest swing lid vacuum packer in the range. The 1000STE XL is constructed from stainless steel and features a stainless steel chamber. All the electrical components inside the vacuum packer are covered by IP65 dust and water level protection. The seal beams produce a double seal on the vacuum bag and this can be changed very quickly and easily to seal and cut off simply by changing one of the wires. The 1000STE XL comes fitted with a Busch 300m3 vacuum pump. Busch pumps are world renown and all internal components are coated to help increase the lifetime of the pump. The meat mincer has a cabinet and feedpan made from high grade stainless steel which is easy to clean and very resistant to corrosion. 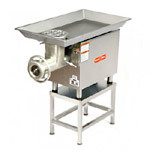 The M32 meat mincing machine comes with a choice of electric supply, eaither single phase or three phase. Both meat mincers comes as standard with a manual, plunger, deflector to prevent product spatter and a 5mm plate and four blade knife. The small and compact mixer grinder is very space saving and best suitable for replacing the manual meat mincing and producing minced meat in small portions nearly touchless. Like all KOLBE mixer grinders, the MWK is characterized by a brilliant production and cutting performance while minimal temperature increasing. This model is able to operate pieces with a temperature till sub zero. This mixer grinder is suitable for the retail, the meat trade and pick-up stores.